This is the tailfin for VFA-25 'Fist of the Fleet'. This is a reproduction of the SECOND squadron patch for the "Fist of the Fleet". They were A-7 drivers out on the West Coast with a history dating back to January 1943. They currently operate the F/A-18C Hornet out of NAS Lemoore, CA. This is their legacy patch created in Nov 1973. This was created by hand in the Phillipines to give it the "authentic" look and feel. The "stars" on the patch stand for WW II, Korea War and Vietnam. Hope to have the "original" design soon. On March 19, 2003, the Fists began combat sorties in earnest and Operation Southern Watch abruptly turned into Operation Iraqi Freedom. The Fist of the Fleet led the way to Baghdad, participating in first-night air strikes on the Iraqi capitol in what has become known as the Shock and Awe campaign. The squadron put in long days, achieving an average daily combat sortie count of 20, while pounding roads from Basra to An Nasiriya, Al Kut, Najaf, Al Hillah and ultimately Baghdad. The squadron�s more than 850 hours flown on 272 combat sorties over 18 straight days resulted in relentless and deadly strikes on the Iraqi regime�s Medina, Baghdad, and Nebuchadnezzar Armored Divisions, military airfields, facilities and command and control infrastructure. The 4 stars on the patch represent the wars that the "Fists of the Fleet" participated in -- WWII, Vietnam, The Gulf War, and OIF. This patch does not have velcro attached. 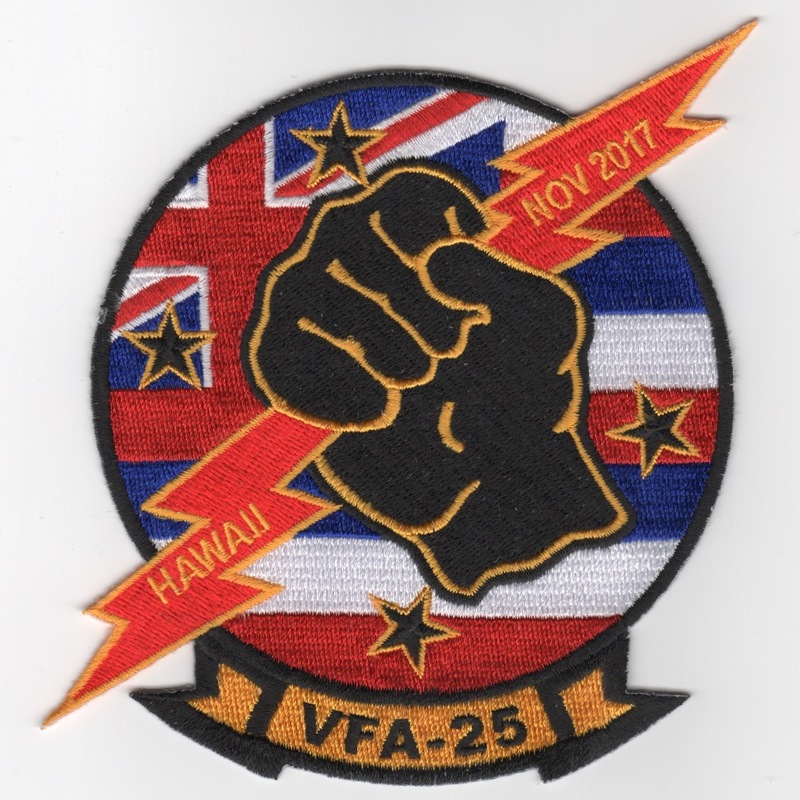 This is the Red/White/Blue version of the squadron patch created by VFA-25 for their Nov 2017 detachment to Hawaii. This isn't the USA flag in the background, but (looks like to me) the British (possibly Australian) flag, so implying that this was some sort of "joint" operation. Was only able to acquire a few of these, so get them while they last. This patch does not have velcro attached. The 'Fist of the Fleet' from VFA-25 fly the F/A-18C Hornet out of NAS Lemoore, CA. They were established in January 1943 and have transitioned to the latest version of the Hornet with all the upgrades. The 'Fist' were paired with their sister squadron of VFA-113 to upgrade simultaneously. 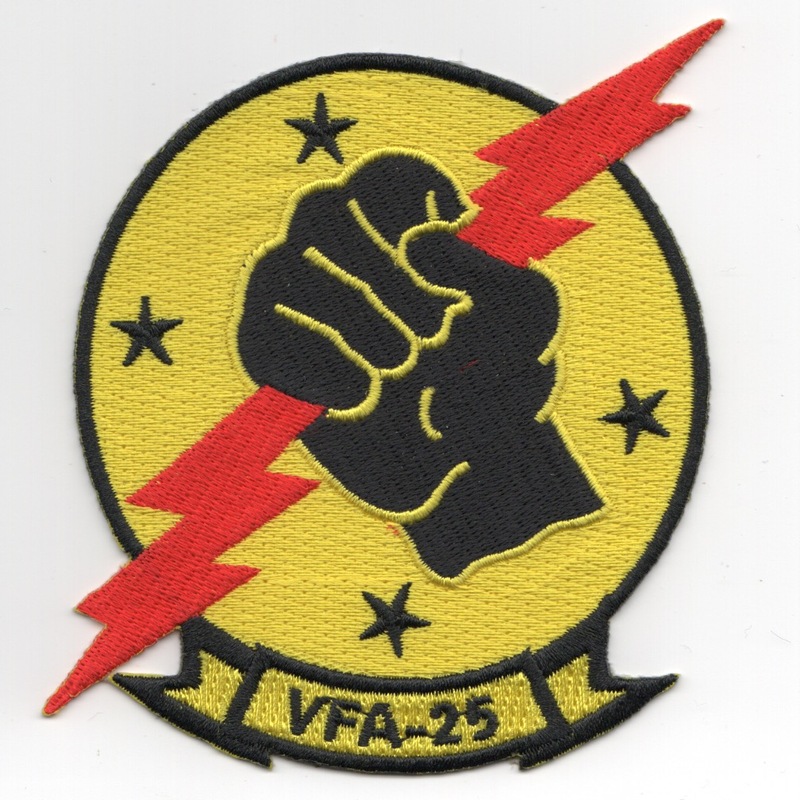 This is one of the "historical" patches created by VFA-25 recently. What was to become the FIST of the FLEET was conceived on September 15, 1941, when the keel of the USS BUNKER HILL (CV-17) was laid. On January 1 1943, VT-17 was formed under the command of LCDR Frank W. �Silver Fox� Whitaker. In those previous fifteen months, the US Navy was busy recruiting, training, and purchasing the aircraft and thousands of items the squadron would need when the USS Bunker Hill was commissioned on May 24, 1943. CVG-17 was also formed on January 1, 1943. This air group became CVBG-17, then CVBG-5 in 1946 and redesignated CVG-6 in 1948. It became CVW-6 in 1963 and was disestablished on April 1, 1992. Numerical designation of air groups began in 1942, many numbered according to their assigned ship (CV-17 .. CVG-17) and each ship had a distinctive graphic design for its aircraft. Aircraft assigned to USS Bunker Hill were identified with a vertical arrow on the tail. 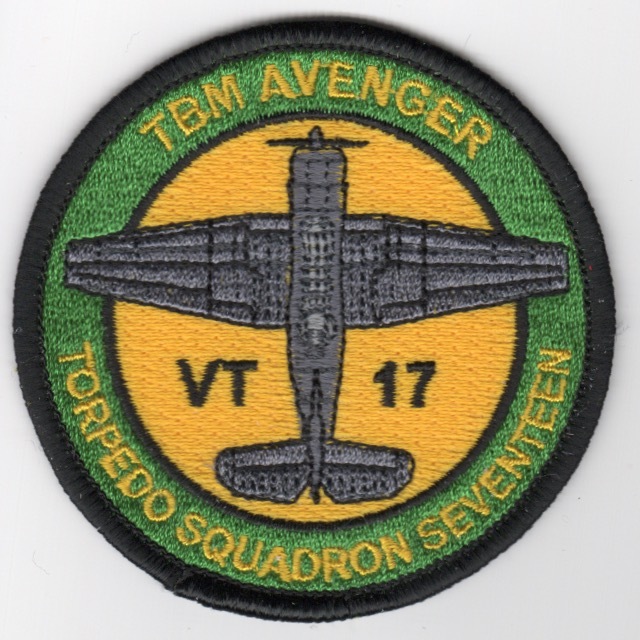 The �Fist of the Fleet� began as Torpedo Squadron 17 (VT-17) at NAS Norfolk (Virginia), initially assigned TBF-1 then TBM-1C aircraft as part of Air Group 17 (CVG-17). The TBM Avenger was the same as the Grumman designed TBF, but built by Eastern Aircraft, a division of General Motors. This patch does not come with velcro attached. 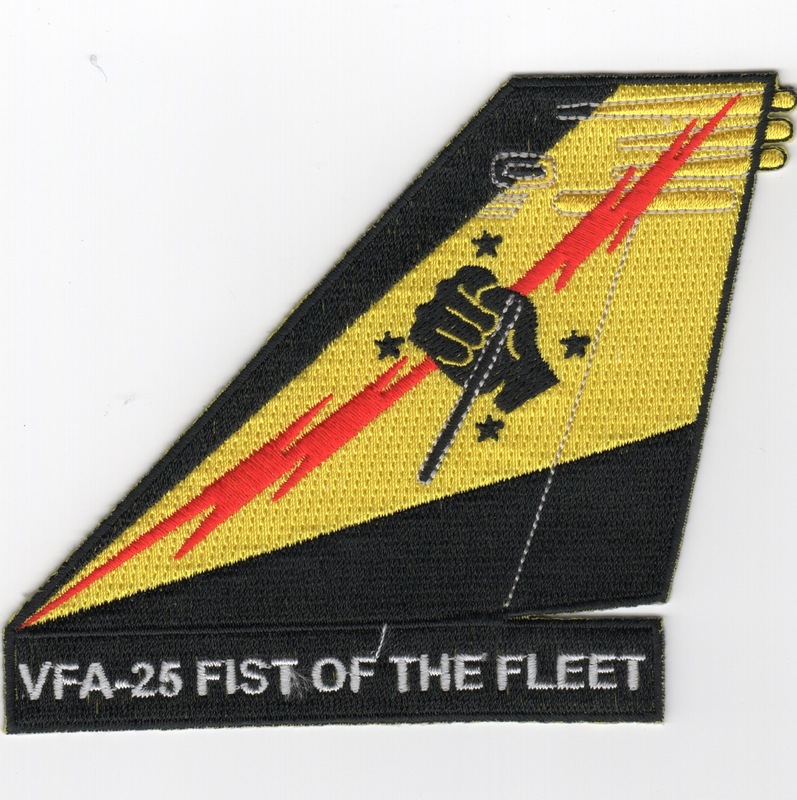 This is the other "historical" patches created by VFA-25 recently. What was to become the FIST of the FLEET was conceived on September 15, 1941, when the keel of the USS BUNKER HILL (CV-17) was laid. 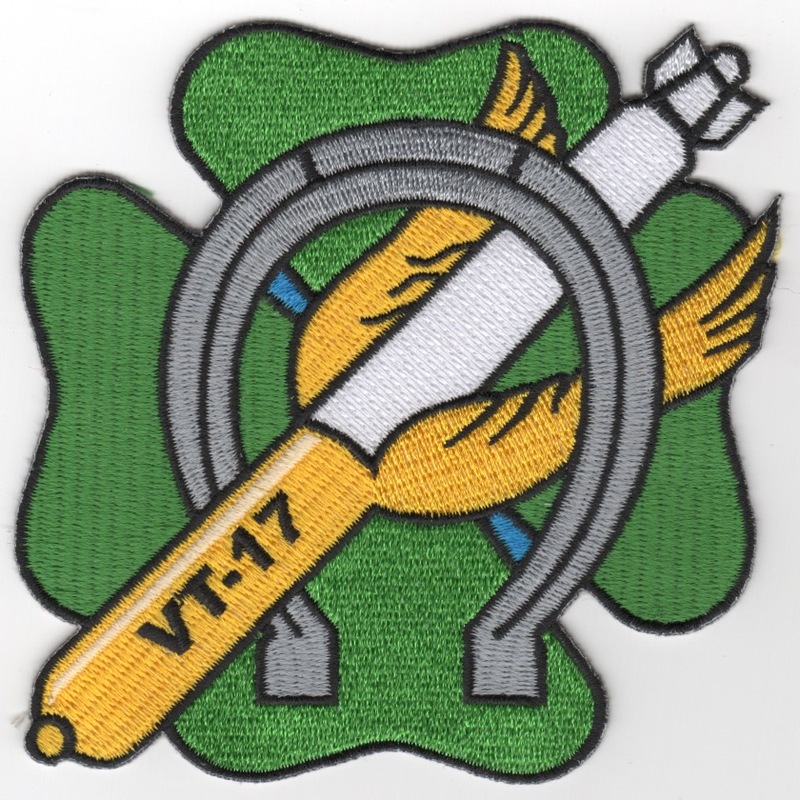 On January 1 1943, VT-17 was formed under the command of LCDR Frank W. �Silver Fox� Whitaker. In those previous fifteen months, the US Navy was busy recruiting, training, and purchasing the aircraft and thousands of items the squadron would need when the USS Bunker Hill was commissioned on May 24, 1943. CVG-17 was also formed on January 1, 1943. This air group became CVBG-17, then CVBG-5 in 1946 and redesignated CVG-6 in 1948. It became CVW-6 in 1963 and was disestablished on April 1, 1992. Numerical designation of air groups began in 1942, many numbered according to their assigned ship (CV-17 .. CVG-17) and each ship had a distinctive graphic design for its aircraft. Aircraft assigned to USS Bunker Hill were identified with a vertical arrow on the tail. The �Fist of the Fleet� began as Torpedo Squadron 17 (VT-17) at NAS Norfolk (Virginia), initially assigned TBF-1 then TBM-1C aircraft as part of Air Group 17 (CVG-17). The TBM Avenger was the same as the Grumman designed TBF, but built by Eastern Aircraft, a division of General Motors. This patch does not come with velcro attached. Homepage | Order VFA-25 Patches!